The commemorative and definitive Vatican stamps issued between 1942 and 1946 celebrate important people and events in Church and World history. During these turbulent years of World War II, one special-purpose series of pictorial stamps carried a message of peace and compassion. 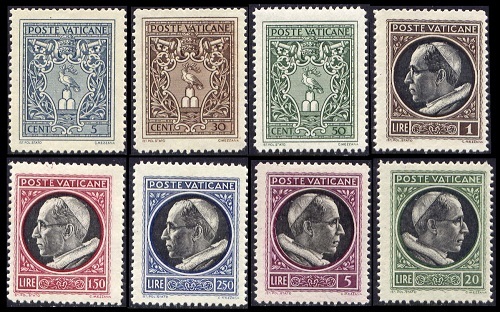 The three sets of special-purpose large-format pictorial Vatican stamps shown above were issued in 1942, 1944, and 1945. The common design features a multitude, standing before the image of Jesus Christ, with the inscription "FLAGRANTE BELLO MISEREOR SVPER TVRBAM" meaning "During Hostilities Have Compassion for the Multitude". This is likely referring to the humane treatment of prisoners of war and / or the humane treatment of refugees. The stamps inscribed MCMXLII (1942) shown above (Sc. #77-79) were issued on September 1, 1942. The stamps inscribed MCMXLIII (1943) shown above (Sc. #84-86) were issued on January 31, 1944. The stamps inscribed MCMXLIV (1944) shown above (Sc. #99-101) were issued on January 9, 1945. Rare varieties of the 3 L. and 5 L. denomination stamps inscribed MCMXLIV exist with the image of Jesus Christ missing. 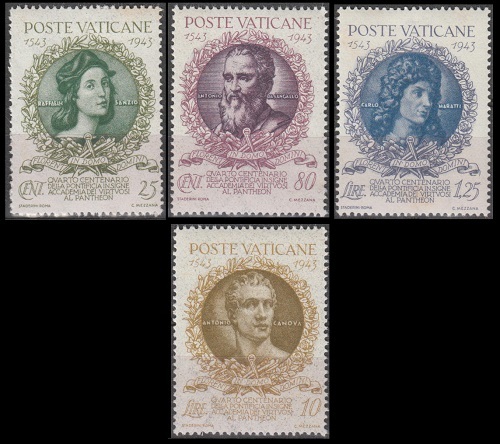 The four pictorial Vatican City stamps shown above (Sc. #80-83) were issued on January 16, 1943 to commemorate the 25th Anniversary of the Consecration of Archbishop Eugenio Pacelli (Pope Pius XII) by Pope Benedict XV (Lived: 1854-1922, Pope: 1914-1922). 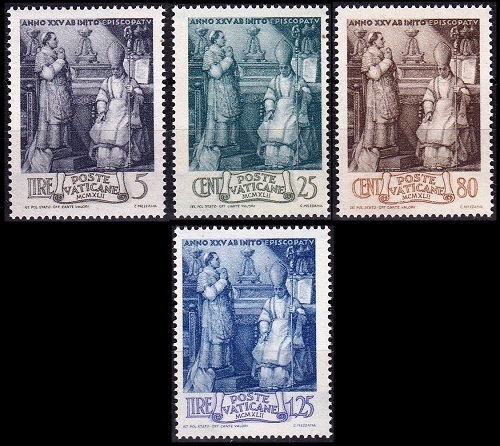 The four pictorial Vatican City stamps shown above (Sc. #87-90) were issued on November 21, 1944 to commemorate the 400th Anniversary of the Pontifical Academy of the Virtuosi of the Pantheon. Raphael Sanzio (1483-1520), the World famous painter and architect of the High Renaissance. His Madonnas, especially the Sistine Madonna, and his murals in the Papal Apartments are regarded as some of the most beautiful works of art ever created. Antonio da San Gallo (1484-1546), the Renaissance architect active in Rome and the Papal States. As an apprentice, he worked with Bramante in the design of the Apostolic Palace. In 1507, he received his first commission, with that being the design and construction of the Church of Santa Maria di Loreto in Rome. Carlo Maratti (1625-1713), an Italian painter, active in Rome, who is known for his paintings executed in the Late Baroque Classical style. Antonio Canova (1757-1822), the Italian Neoclassical sculptor, famous for his marble statues. One of his most famous sculptures is the reclining figure of Pauline Bonaparte as Venus Victrix, now in the Galleria Borghese in Rome. The Pontifical Academy of Fine Arts and Letters of the Virtuosi of the Pantheon was founded on October 15, 1542 by Pope Paul III (Lived: 1468-1549, Pope: 1534-1549). It is a pontifical organization of painters, sculptors, architects, musicians, poets, and authors who have achieved the GREATEST LEVELS OF ARTISTIC ACCOMPLISHMENT. The current members occasionally stage exhibits or performances at the Pantheon in Rome. Four of the organization's honorary members are pictured in the stamps shown above. 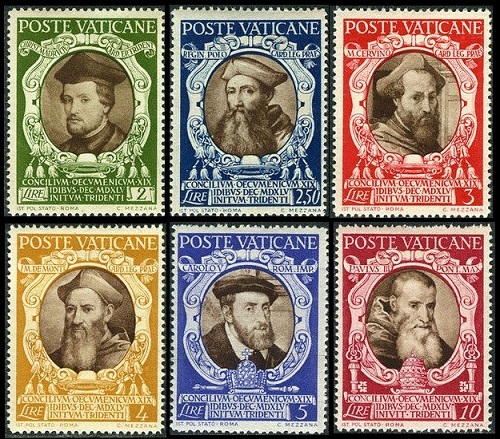 The eight new definitive Vatican stamps shown above (Sc. #91-98) were issued on March 5, 1945. These definitive stamps are engraved on unwatermarked paper, and they are perforated 14. The two common designs feature the Coat of Arms of Pope Pius XII and the portrait of Pope Pius XII. All of them, except for the two highest denominations, exist in pairs that are imperforate between. 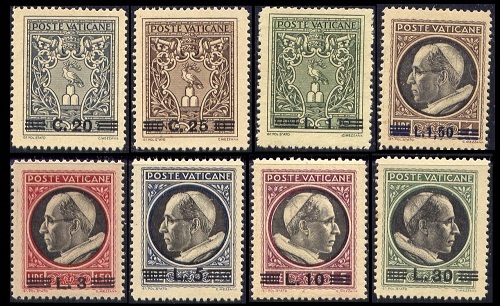 The eight re-valued definitive Vatican stamps of 1945 shown above (Sc. #102-109) were issued on January 9, 1946. Most of them exist in pairs that are imperforate between or in pairs with one stamp missing the overprint. 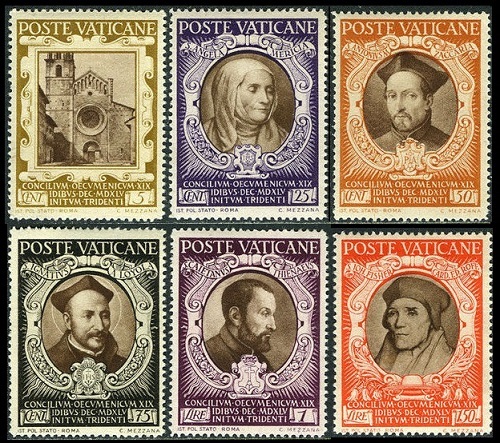 The twelve pictorial commemorative Vatican stamps shown above (Sc. #110-121) were issued on February 21, 1946 to celebrate the 400th Anniversary of the Council of Trent. The twelve designs are as follows. 05 C. - St. Vigilio Cathedral in Trent. 25 C. - St. Angela Merici. 50 C. - St. Anthony Zaccaria. 75 C. - St. Ignatius of Loyola. 01 L. - St. Cajetan Thiene. 01.50 L. - St. John Fisher. 02 L. - Christoforo Cardinal Madruzzi. 02.50 L. - Reginald Cardinal Pole. 03 L. - Marello Cardinal Cervini. 04 L. - Giovanni Cardinal del Monte. 05 L. - Holy Roman Emperor Charles V.
10 L. - Pope Paul III. The Council of Trent, held in Trent and Bologna Italy, in twenty-five sessions between 1545 and 1563, was one of the Roman Catholic Church's most important ecumenical councils. Prompted by the Protestant Reformation, the Council of Trent has been described as the embodiment of the Counter-Reformation.